This past Friday, May 25, 2018, President Trump usurped Congressional authority as well as undermined settled policy and law when he issued three executive orders denying the rights of federal workers contained within Title 5 governing civilian personnel matters. Title 5 is the driving factor that ensures that corruption, patronage, and politics do not influence the federal workforce. However, President Trump disregarded the constraints on his constitutional powers, and unilaterally proclaimed what amounts to be new law — despite the fact that bipartisan majorities of both houses of Congress have consistently supported Title 5. 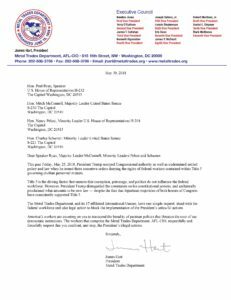 The Metal Trades Department, and its 17 affiliated International Unions, have one simple request, stand with the federal workforce and take legal action to block the implementation of the President’s unlawful actions. America’s workers are counting on you to transcend the banality of partisan politics that threaten the core of our democratic institutions. The workers that comprise the Metal Trades Department, AFL-CIO, respectfully and forcefully request that you confront, and stop, the President’s illegal actions.